The Dallas-Fort Worth region boasts a growing economy larger than that of many countries — but it also sports some of the worst air quality in the nation. Scientists fear the politics of economic growth is preventing improvements. When the Dallas County Medical Society asked Texas environmental regulators in October to increase pollution controls on coal-fired power plants, they knew it would be a tough sell. But the association of more than 6,500 physicians said it was fed up with seeing patients suffering from the region’s air quality problems, which are among the worst in the nation. 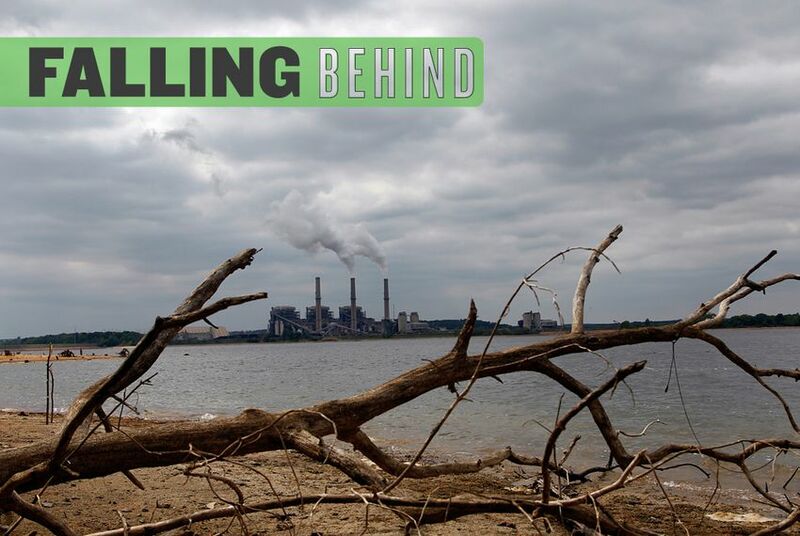 And members said real improvement was possible by targeting two of the nation’s oldest coal-fired plants, which are among the state’s biggest sources of nitrogen oxide emissions — air pollutants that reacts with other toxic chemicals in the presence of sunlight to create ozone. Still, the association’s members were not prepared for what happened when the Texas Commission on Environmental Quality (TCEQ) took up their request. The commission denied the medical society’s petition, following the recommendation of its staff. Doctors and scientists across the state believe that the Dallas-Fort Worth region’s ozone levels are a major public health concern. 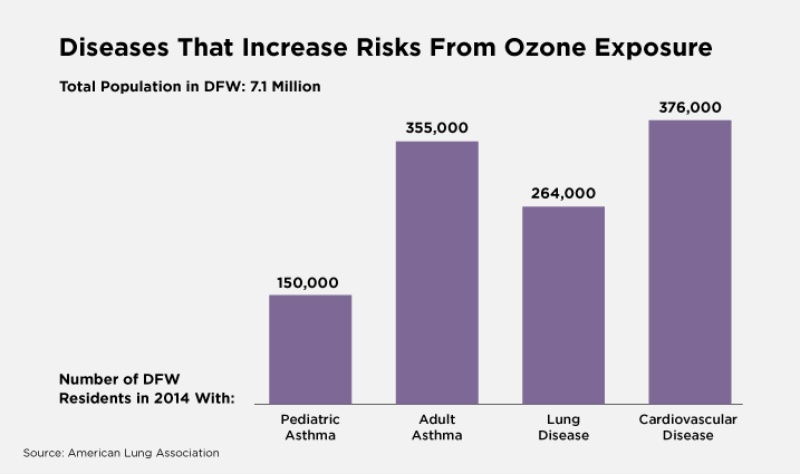 High levels of ozone are particularly risky for people with asthma, lung disease, heart disease and even diabetes — health problems that afflict more than 1.5 million North Texans out of a population of roughly 7 million. People who suffer from asthma, lung disease and heart disease are at additional risk when they are exposed to high ozone levels. 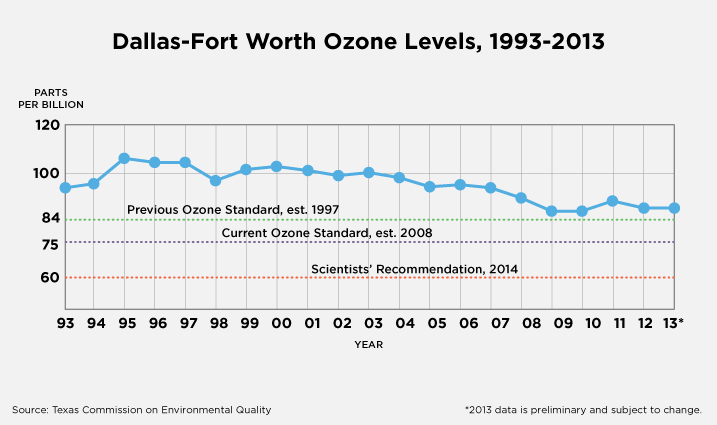 Dallas-Fort Worth ozone levels have long been well above federal standards set to protect health, and scientists are pushing for those standards to be even lower. But some of them fear Texas officials and politicians are too focused on bolstering the state’s explosive economic growth and energy boom to comprehensively deal with the problem. “It’s very political, a lot of economic issues involved,” Haley said. In public statements, Shaw has argued that requiring expensive pollution controls in coal-fired plants could have an “economic ripple” effect, driving up the price of power and disproportionately affecting poor Texans. And state officials point out that Texas’ air quality has improved significantly since 2000 despite a huge population increase, as nitrogen oxide emissions decreased by more than 50 percent. While that trend has been mirrored nationwide — due in large part to new vehicle pollution standards imposed by the federal government — Texas’ investments in cleaner energy sources and vehicle replacement programs have also played a role, officials say. 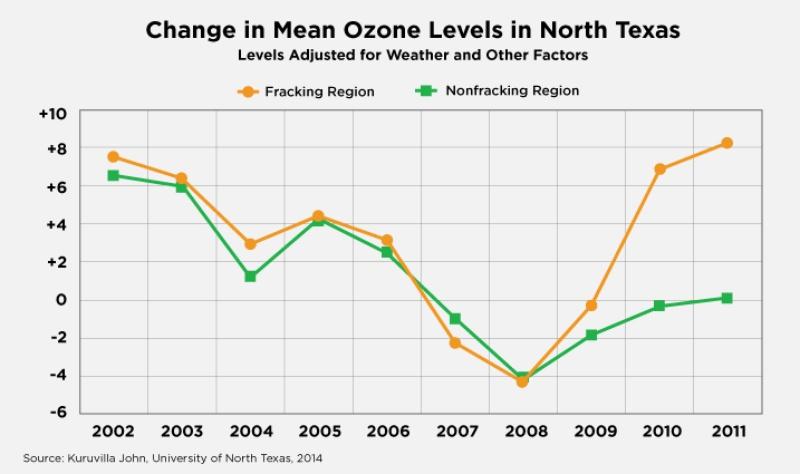 But the steady downward march that ozone levels began in North Texas in 2000 stopped in 2007. The TCEQ says it is committed to reducing ozone levels. Still, in recent years its work has not translated into comprehensive policies or solutions, scientists and advocates say. When TCEQ commissioners voted against more restrictions on coal plant emissions last October, they said such a change would be premature because the agency is already working on a federally required plan to reduce ozone levels in the Dallas-Fort Worth region. But in each of the five related plans it has developed since 1991, the agency has predicted that the region would meet federal ozone limits within one to five years — and it has always been wrong. In the 2011 plan, staff said that new federal gasoline standards alone would help ozone levels drop from more than 85 parts per billion to 78 in just two years (the current standard is 75 parts per billion), and rejected dozens of other strategies suggested to improve air quality, such as reducing emissions from cement kilns or coal plants. Today, levels still hover around 87 parts per billion. The ozone levels shown are known as "eight-hour design values." Monitors measure ozone concentrations over eight-hour periods, and regulators calculate the design value by averaging the highest numbers over a three-year period. David Brymer, director of the TCEQ’s office of air, said the agency’s models have improved significantly. And he pointed out that the region’s ozone level is calculated over a three-year period, so the current one includes the unusually hot year of 2011. The agency now says it believes that new federal gasoline standards and the increase of newer, more efficient vehicles will allow ozone levels to drop to just over 75 parts per billion by 2018. Local officials aren’t so sure. The Legislature had established a program in 2001 creating incentives for better pollution controls on vehicles — by far the biggest contributor to pollution and high ozone levels — but hundreds of millions of those dollars have instead been used to balance the state’s budget. Similar budget maneuvers also caused the North Central Texas Council of Governments to lose funds to help low-income residents replace older cars. Chris Klaus, a transportation planner for that organization, said those funds are important in a region where newcomers arrive every day and are on a budget. Klaus pointed out one positive development for air quality in the region. He said President Obama’s recent pledge to reduce greenhouse gas emissions from power plants would probably result in stronger pollution controls on coal plants, or cause such plants to be replaced by cleaner-burning natural gas and renewable energy sources. But Gov. Rick Perry has called the proposal “the most direct assault yet on the energy providers that employ thousands of Americans, and fuel both our homes and our nation’s economic growth,” and Texas Republicans are already threatening to fight it in court. Even if newer cars and less coal-fired power help improve air quality in North Texas in the coming years, scientists and environmental advocates worry about another wild card: natural gas extraction in the Barnett Shale, which took off in the mid-2000s. Some have speculated that activity in the Barnett could be tied to the appearance that the region’s air quality gains have stalled. The shale boom brought a rash of new diesel trucks to the region, along with drilling equipment, compressor stations and tanks. Those can be major emitters of nitrogen oxide and volatile organic compounds, or VOCs — the building blocks of ozone. Many scientists believe that gas drilling and related activities play a big role in the region’s ozone levels, though they say more research is needed to be sure. “When people dig into the matter a lot deeper than they have, they will find that oil and gas activities do have a significant impact on ozone attainment,” said Jay Olaguer, a senior scientist at the independent Houston Advanced Research Center. Olaguer has studied VOC emissions in the Houston area and modeled what such emissions could do in the Barnett Shale. Olaguer said the TCEQ doesn’t have enough monitoring equipment that can move around in real time — a disadvantage in a business where drilling locations constantly change. In addition, the agency normally relies on companies to report emissions data, but there is no way to independently verify those numbers or keep track of unauthorized emissions. Nor does the agency require companies to respond to emissions surveys. Kuruvilla John, an expert on air quality modeling at the University of North Texas, found that — when controlling for weather and other factors — the region’s ozone levels have been increasing in recent years, and more so in its western portion, where Barnett Shale drilling is prevalent. “These new sources and unconventional sources … were never in the cards a decade ago,” he said. University of North Texas research found that ozone levels increased across North Texas in the past several years, but more so in the "fracking regions" — the western portions of Dallas-Fort Worth where Barnett drilling is prevalent — than in the "nonfracking regions." The Barnett Shale Energy and Education Council, a nonprofit set up by a coalition of drilling companies that operate in North Texas, says drillers act responsibly in the Barnett and there is no solid evidence that emissions from their activities are harmful. Ed Ireland, spokesman for the council, added that emissions are limited because the industry can now extract more gas with less activity. The TCEQ says that Barnett drilling does not make a meaningful contribution to high ozone levels — although even its own staff at one point suggested otherwise. In 2008, an agency report recommended that Wise County, a hotbed of natural gas drilling, be added to a list of North Texas counties considered to be in violation of the ozone standard. Even though its population is small, staff wrote, “stationary sources” in Wise County — in other words, facilities like drilling rigs and natural gas compressor stations — were major contributors of nitrogen oxide emissions. Asked why the agency apparently changed its position on Wise County, TCEQ spokesman Terry Clawson said, “Our subsequent analyses have shown that Wise County does not significantly impact the DFW ozone monitors.” He did not elaborate but said that Wise County itself does not have an ozone monitor. The EPA disagrees, pointing out that a monitor located just outside the county has consistently displayed ozone levels far above the federal standard. The case, which has yet to be heard in federal court, has so far cost the state more than $22,000, according to the attorney general’s office. Legal experts say it’s a long shot for Texas. “You almost never win if you challenge EPA’s models,” said Thomas McGarity, a professor of environmental law at the University of Texas at Austin. In the meantime, the debate continues over the amount of emissions coming from oil and gas operations in the Barnett Shale area. The TCEQ has done its own study of Barnett Shale emissions, asking companies for data from thousands of drilling sites in 2009. But when UT-Austin researchers evaluated the TCEQ’s study in research published this year, they found that increased Barnett Shale production and underestimation of the polluting power of certain pieces of equipment meant VOC emissions should be one-third higher than the agency had found. VOCs in particular are considered somewhat of a “double whammy” by scientists and public health professionals — not only are they an ozone precursor, but by themselves, they’re also toxic chemicals that can have a variety of short- and long-term health impacts. “Even if they don’t undergo the chemical reaction to become ozone, they are very, very reactive,” said Amie Lund, a researcher at the University of North Texas who has studied the effects of temporary high emissions of VOCs from vehicle tailpipes on animals. She found that several hours of exposure at such levels could cause the clinical indicators of the onset of a heart attack or stroke, even in animals without chronic health disease. Lund said research like hers about the effects of volatile organic compounds is still in its early stages in the scientific community, so regulators are not likely to pay attention. But recognizing that the lag time between science and policy is long, she is working on communicating her findings directly to the public. “Maybe they can be proactive in protecting themselves,” she said. Disclosure: Rice University and the University of Texas at Austin are corporate sponsors of The Texas Tribune. A complete list of Texas Tribune donors and sponsors can be viewed here. Editor's note: An earlier version of this story included an incorrect and abridged transcription of a quote from TCEQ Chairman Bryan Shaw.